I may have mentioned that AK is a big chicken eater. He prefers it to any other kind of meat, specially on an everyday basis. Which means that we cook chicken in the house every single day. 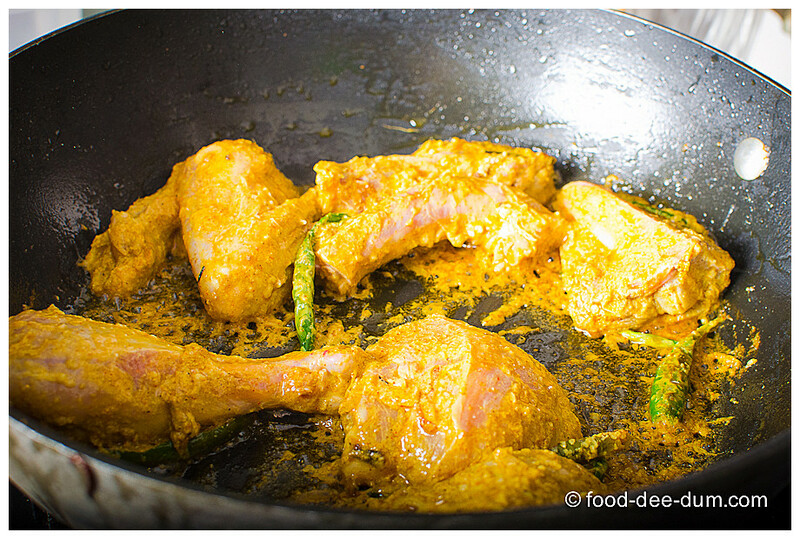 And I just realised that I haven’t posted a single chicken recipe here — the Indian curry kind that we may have with roti or rice. I almost couldn’t believe that I had left out such an important part of our culinary life off this blog! 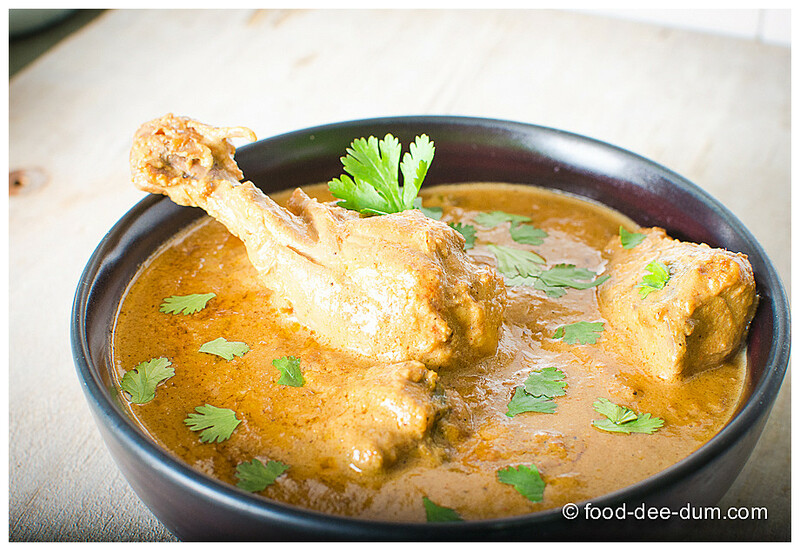 Now that it has come to my attention, I decided to start with this current favourite – Murgh Badami or Chicken in Almond Curry. 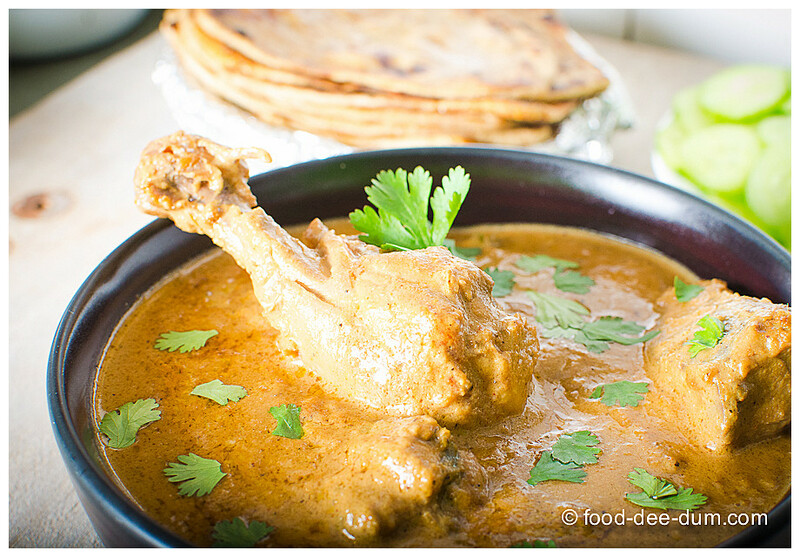 This chicken has a mild but flavourful curry, almost a thick masala actually, and is best served with fresh, hot paranthas. 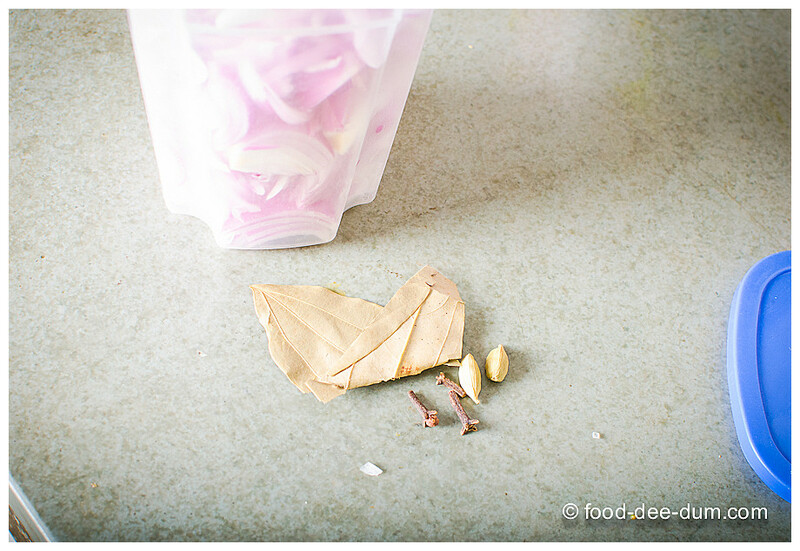 It can be thinned out a little and served with rice as well but I find that it works better with roti or parantha. Don’t be scared off by the fancy name — it’s actually quite a simple recipe and doesn’t take too long to make. Washed and drained the chicken. 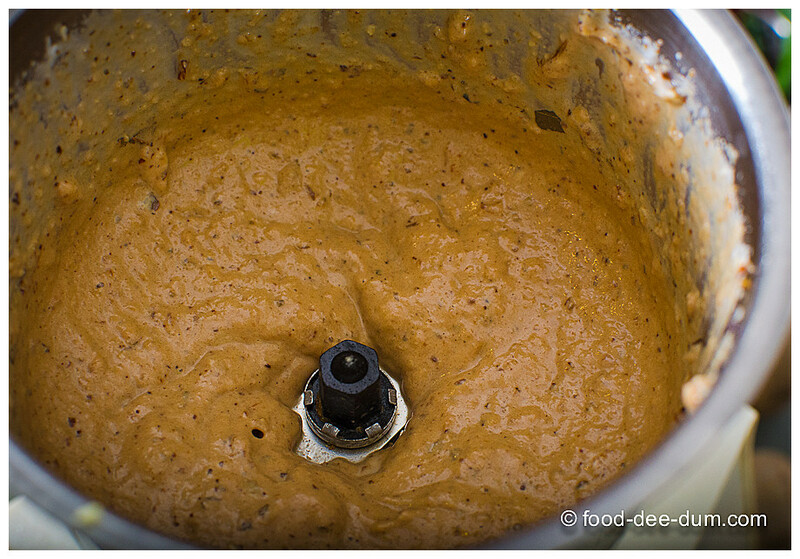 In a bowl, I started mixing the marinade. 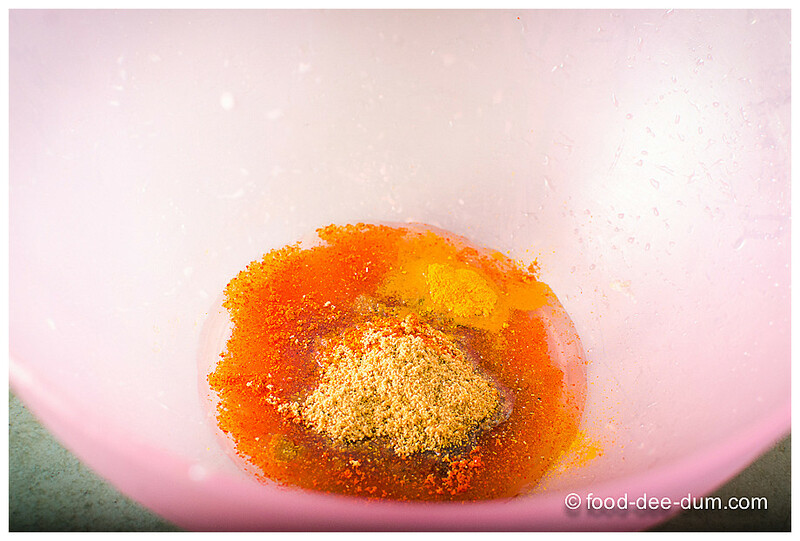 First the oil with the salt and all the dry masalas – mix this with your fingers to ensure that no masala remains lumpy and that it is well incorporated. 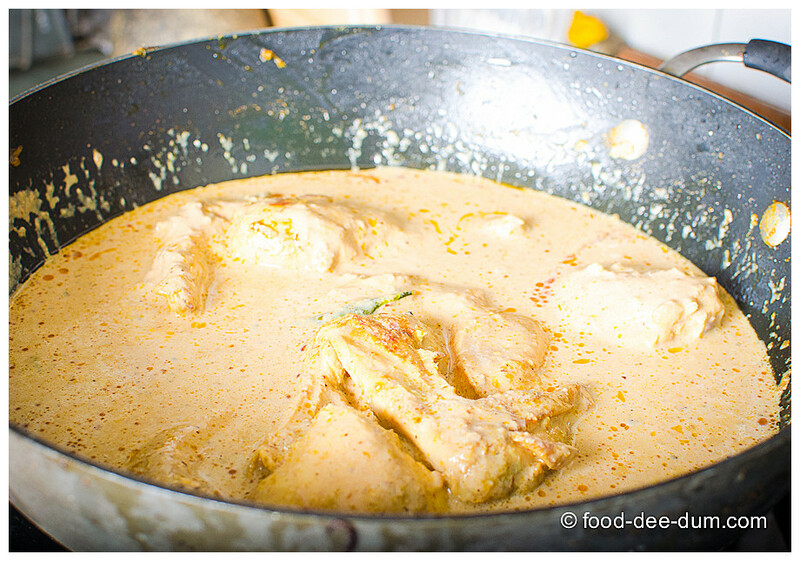 Add the dahi and ginger-garlic paste and mix to combine. 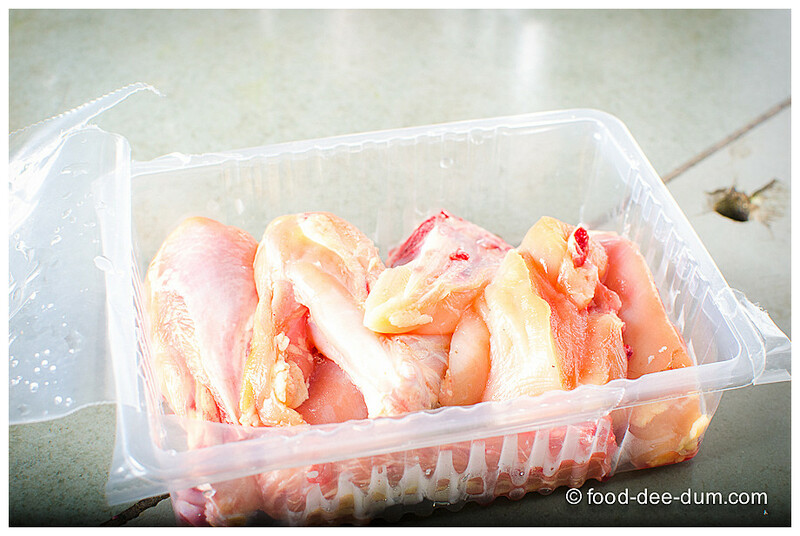 Add the chicken pieces and use your hands to coat it all with the marinade. Let this rest while you get everything else ready. You can even do this a few hours in advance if you like and keep it in the fridge. 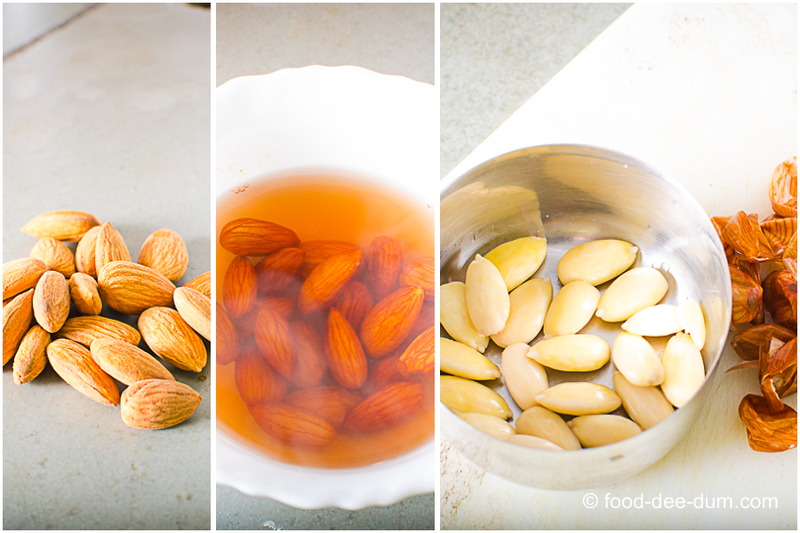 To blanch the almonds, I took a handful of almonds, covered them in boiling water and let them rest till they returned to room temperature. Or at least a handle-able temperature. Then I just slipped the skins of and kept them aside. 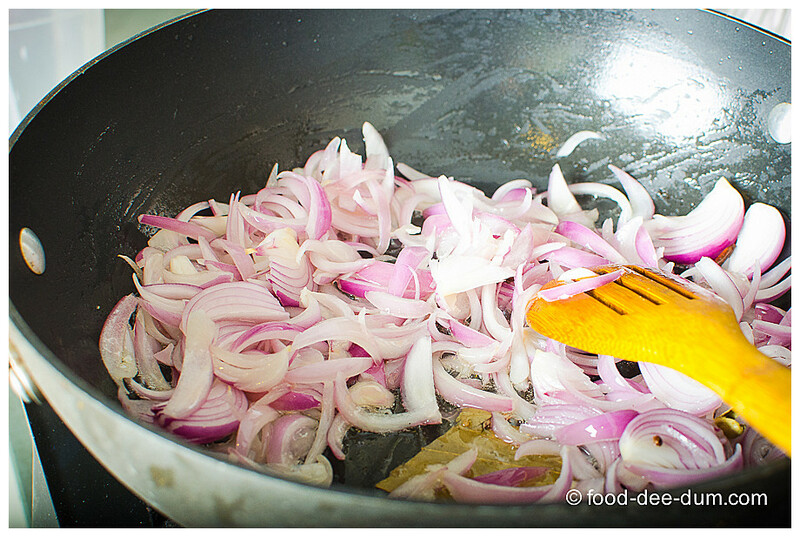 Measuring out the khada masala or whole spices (cinnamon not pictured because I was out on that day) and the onions, I set the oil in a kadhai (wok) to heat on high flame. 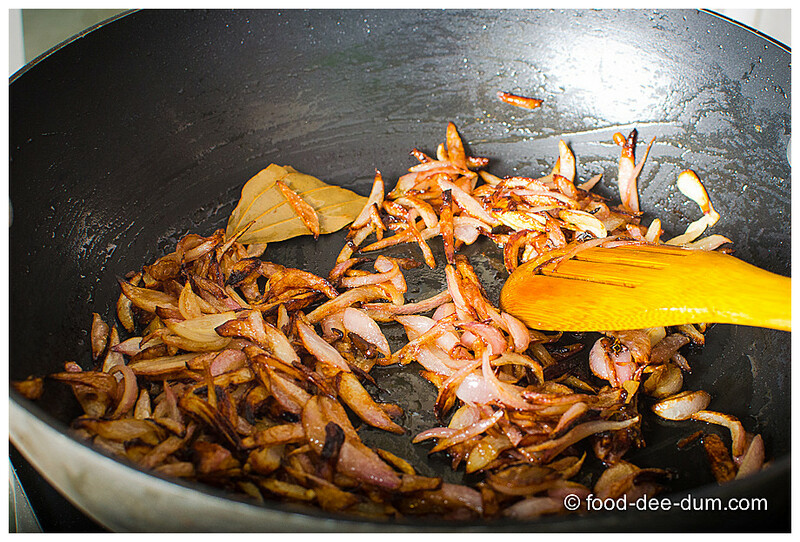 Adding khada masala to the oil till fragrant, I followed it up with the onions and proceeded to fry them, stirring often, until they were a deep golden with a few tinges of brown, about 7-8 minutes. Adding a pinch each of salt and sugar helps hasten this process. 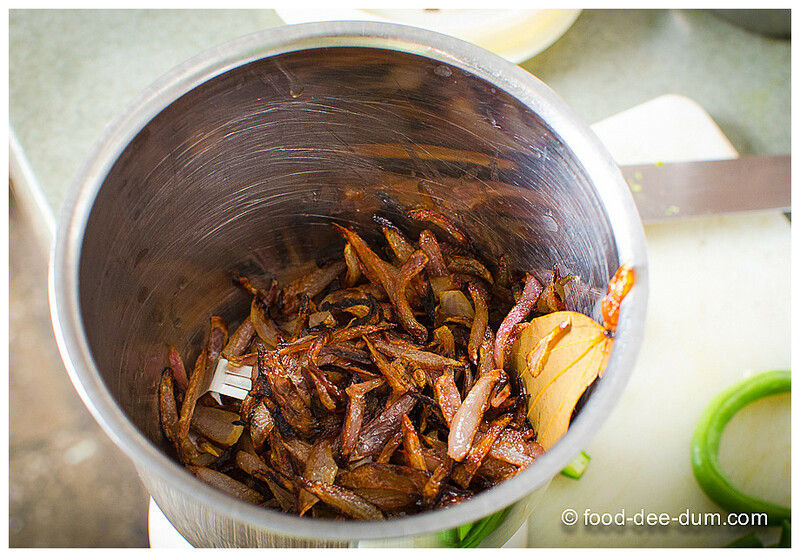 Once the onions reached the colour I wanted, I removed them from the heat with a slotted spoon and transferred them to the grinder jar of my mixie — leaving most of the oil behind in the kadhai. I placed this under the fan on the dining table to cool quickly while I fried up the rest. 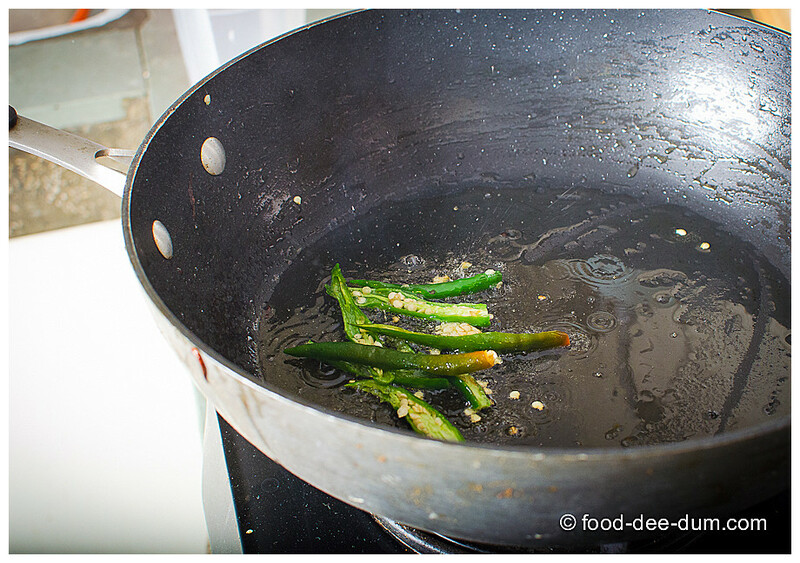 In the same oil and kadhai, I added the slit green chillies until they sputtered madly! 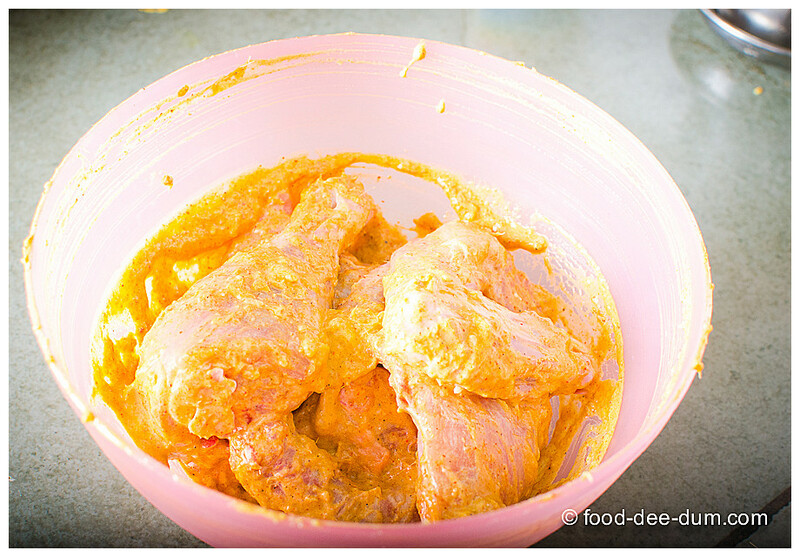 Then I tipped in the marinated chicken and cooked on high heat until it stopped looking pink from the outside. Then I lowered the heat to medium and continued to cook it for another 7-8 minutes until the outsides started to brown. 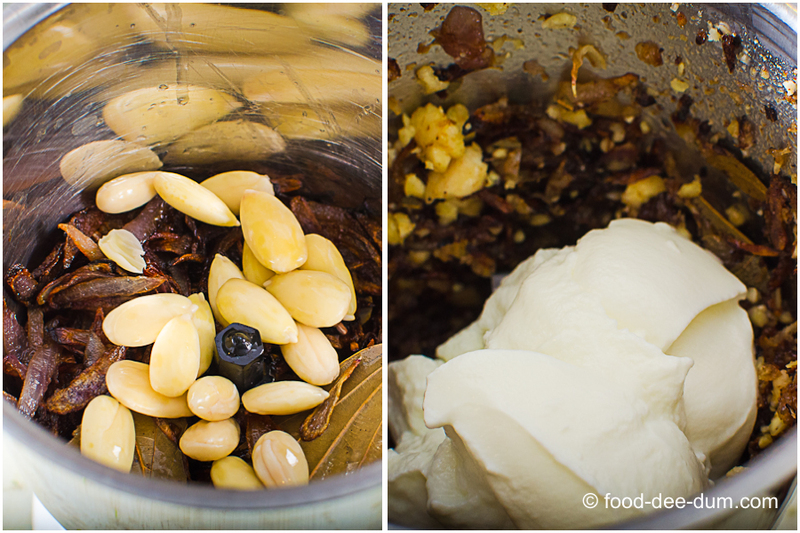 By this time the onions had cooled and I added the almonds to the grinder jar and pulsed till they formed a coarse paste. 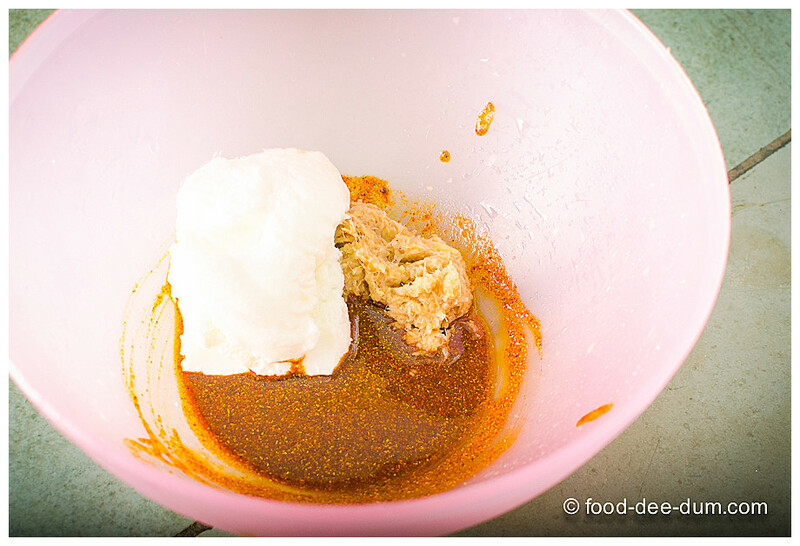 Then I added the curd to it and blended till it formed a smooth paste. I added this paste along with 1/2 tsp salt and 1 cup water to the chicken and increased the heat to high, bringing it to a boil. Once it came to a boil, I placed a lid on the pan and lowered the heat to a simmer and cooked it till the chicken was done, about 20 minutes. I lifted the lid and stirred it occasionally during this time. 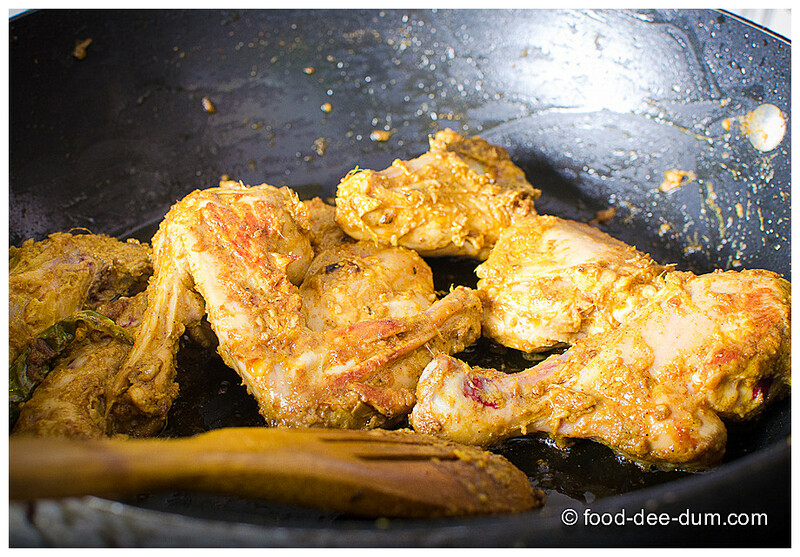 I cooked it for a further 4-5 minutes on high flame with the lid off to let some of the water evaporate and the curry to coat the chicken nicely. 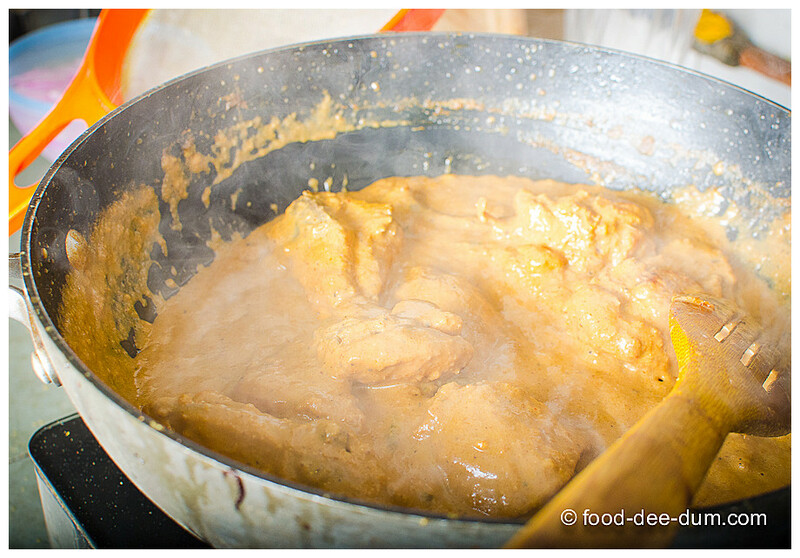 If you are having it with rice, you can skip this and maybe even increase the water content. Taking the chicken off the heat, I mixed in 2 heaped tbsp of chopped cilantro and used the rest to garnish on top once I place it in the serving bowl! I served it up with hot paranthas and a simple onion and cucumber salad.